As the intrepid Sister Gertrude reminds us in Muriel Sparks’ The Abbess of Crewes: a problem you solve; a paradox you live with. A long-standing question in philosophy is whether the relationship between mind and body (or mind and brain) is a problem to be solved or a paradox to be lived with. If it is a problem to be solved, then the history of Western thought (that deposit of our faith) has provided us with two main approaches to solving it. We can be either dualists or monists. The decision is based on the number of types of things we think there are. The dualistic approach to the mind/body problem, as presented to us most famously and rigorously by Descartes, but which may date as far back as Plato, says there are, ontologically speaking, two fundamental sorts of things. There are extended things (res extensa) and there are thinking things (res cogitans). Extended things are those which are composed of parts outside of parts, and thinking things are those which are not extended, i.e., which have no parts. Extended things can be quantified, measured, plotted on a grid, located, and are—at least in principle—accessible to all. This means they supersede perspective. They can be fully comprehended in their surfaces, in their geometry and geometrical relations, in their mathematico-physical determinations. Note that when I say “in their surfaces” I am not referring to anything necessarily simple or superficial. As extended things are composed of parts, each part will have its “surfaces,” and these parts may form extremely complex networks of relationships. In any event, they are the foundation for a “third-person” ontology, which in turn is the foundation for science. Thinking things, in that they have no parts, are not susceptible to measurement, quantification, or localization. They cannot be mathematically or physically determined—they are not that sort of thing at all. They are the foundation for a “first-person” ontology (if there is such a thing), but they will not be comprehensible by science (or by the same sort of science, if there is more than one kind science) as are extended things. In short, extended things and thinking things are, as they say, apples and oranges—two fundamentally different types of things. The trouble is, these apples and oranges always make their appearance at the same time. Hence the mind/body problem: how does an immaterial, nonphysical, non-locatable (it is literally nowhere) thinking thing produce effects in a material, physical, tangible extended thing? Descartes had his ideas about it. He thought that in the pineal gland somehow thought interacted with body. But even if he were right, he would only be answering the “where” question, not the “how” question. The temptation to accept the dualist position stems from its taking seriously mental life. It makes no effort to explain consciousness, emotion, intentionality, will, desire, or any other aspect of mental life in terms of material or physical being. That would be, to a dualist, not to explain but to explain away consciousness. But most of us have no wish to give in to this temptation because the cost seems much too high. It would require that we abandon our hopes for a science—which would appear to depend upon “third-person” ontology—of consciousness. In fact, most of us—and almost all of us who are denizens of the kingdom of science and technology—are monists. We think there is just one fundamental sort of thing, viz., matter. That is our working assumption. Now one way to be a monist is to adhere to a program of reductive physicalism. That means, your hope would be to explain absolutely everything in terms of matter in motion. You might take “matter” in a wide sense to include “energy” (as we know they are convertible), but nevertheless what there is is matter. The temptation to this position stems from its promise of something like a grand unified theory of everything, a consistent theory that at least in principle promises completeness. And with completeness would come—again, at least in principle—predictability. At the atomic level we have very substantial (even though not perfectly good) reasons for thinking that what happens happens according to the strictly deterministic laws of nature. So much about reality allows itself to be explained according to physical laws that admitting the existence of some “thing” that does not submit to these laws strikes us more as giving up the game of science all together. But what are the prospects of explaining, say, the collapse of the international finance system due to the unsupportable risks of credit default swaps in terms of protons and neutrons, quarks and charms? Exceedingly slim, I would say…about the same as predicting earthquakes at the molecular level. And the prospects are no better for explaining why I reach for the freezer door handle when I want a frosty mug for my beer at the neuronal level. An important question is why would we even want to make explanations at this level. If all reality—including human social reality—were fully explicable in terms of deterministic physical laws, then what would become of, say, the ideas of moral responsibility, creativity, and love? These ideas depend upon a metaphysical concept of freedom (whatever exactly that means) that would be dashed on the rock of physical determinism. Some thinkers seem sanguine about such a prospect, but it is a minority view. Most of us want to maintain what we take to be perfectly meaningful talk of choice and responsibility, as the cost of forgoing it would be much too high. Thus on the one hand we do not want to admit that science has such narrow limits as to tell us nothing about consciousness but on the other we do not want to give up a “first-person” ontology all together. Both naturalistic and materialistic science and the psychological, social, economic, aesthetic, and moral discourse we all engage in are too important to dispense with. So are we left with a problem or a paradox? Neil Campbell has given us a concise and excellent example of an attempt, if not to solve, then at least to point towards a solution to the problem of mental causation—how the mind has causal effect on the brain/body. His general position on mental causality is not original. In fact, it is perhaps the most widely help position among philosophers of mind and consciousness. Campbell’s book is teasing out some of the nuances of the position by way of critically elaborating the views of Donald Davidson. However, the book offers the neophyte to such questions a clear and succinct presentation of the philosophical issues at stake and is accessible to any interested reader. Campbell is one of many proponents of non-reductive physicalism. Non-reductive physicalism is purportedly an alternative to reductive physicalism, but one which does not revert to dualism. It is best not to think of non-reductive physicalism as a theory in its own right. Think, instead, of non-reductive physicalism as a disideratum, as a standard by which to judge how satisfactory to our intuitions is any particular theory of mental causation. The tenets of non-reductive physicalism represent our basic intellectual commitments going into the question from the start. What are those tenets? First, there is the commitment to non-reductionist explanations of consciousness, of mental states, and of mental causality. We will not be satisfied with any theory that explains away thought, consciousness, intentionality, desire, creativity, or moral responsibility as mere illusion. We are committed, for example, to the idea that our wanting a drink is causally connected to our getting a drink. We are committed to the idea that our desire for that which is not our own is causally connected to our stealing that thing and that we are responsible for that theft. The second commitment rules out dualism. Couple that with the first commitment, and the third seems to follow. But notice the slippage in the terminology. Physical events have (only) physical causes. Mental events have explanations couched in physical terms. Commitment 3 does not say that mental events have (only) physical causes, for that would violate the commitment to non-reductionism. If non-reductive physicalism is a disideratum, a standard for evaluating theories of consciousness, then can any theory satisfy its requirements? And, if a theory were to satisfy its requirements, what kind of a theory would we have? Non-reductive physicalism addresses our (apparently conflicting) intuitions about reality and ourselves, but are our intuitions really correct? Can we save the appearances? How can we have a theory that includes supervenience but that does not end up reducing the mental to the physical, on the one hand, or that does not end up reintroducing an irreducible dualism, on the other? Is non-reductive physicalism a matter of trying to have our cake and eat it, too? 1. At least some mental events enter causal relations with physical events. 2. Events related as cause and effect fall under strict deterministic laws. 3. There are no psychophysical laws. Certainly, the first principle is true. I hit my thumb with a hammer (physical event) and I feel pain (mental event). Or I desire to eat cake (mental event) so I slice myself a piece (physical event). The second principle has to be true. In physics, we have Boyle’s law: “For a fixed amount of an ideal gas kept at a fixed temperature, P [pressure] and V [volume] are inversely proportional (while one increases, the other decreases).” In other words, decreasing the volume of a fixed amount of gas causes the effect that the pressure increases. This is an example of just what we mean when we say that X causes Y. Every time X happens, Y happens because of X in a regular, predictable, deterministic, law-like manner. The third principle is the controversial one. Think about it: I might say that “I voted for Obama because I liked his war policy.” I will be very, very unlikely to say, for instance, “I voted for Obama because of the state of my hypothalamus.” But why is this? To answer this question, we have to look at “type identity theory”—the idea that for every type of mental event there is a type of physical event that is identical with it—and why this theory is implausible. a. multiple realization – mental states can be realized in various ways (and not just one way). For instance, in humans beings pain is a function of the stimulation of c-fibers. But what would pain be for, say, an ant or an octopus or a Martian? b. neural plasticity – even if we were to limit ourselves just to discussing human beings, it turns out that our neurological systems are, in fact, highly “plastic” or variable or malleable. We know that damaged brains are able to re-wire themselves and become alternative sets of functionings (but still resulting in, for instance, pain). c. mental holism (from Donald Davidson) – all beliefs and desires are modified and mediated by other beliefs and desires. None of us has exactly the same network of experiences and beliefs, so we cannot have the same types of physical states tied to them. From these three points, we can conclude with Davidson and Campbell (among many others) that there are no strict psychophysical laws. I.e., there are no clear “bridge laws” from the mental to physical or vice versa. So if all three of Davidson’s principles are true, then it seems like we are forced into a choice to figure out what the real cause is. Is it mental or physical? a. Only mental causality is the real cause. –But then we are back in dualism, with the mental as something mysterious. We are committed both to causal closure and explanatory completeness, and this choice would give us neither. b. Only physical causality is the real cause. –But then the mental seems “epiphenomenal.” In other words, the mental seems to “ride on top” of the physical and be more or less illusory. This would not explain the mental, but explain it away. But we are looking for a theory that is committed to non-reductionism, but this choice reduces the mental to the physical (i.e., says that the “mental” is nothing but the physical). Donald Davidson thinks he has an answer: “anomalous monism.” Basically, it is “token identity theory.” For every token of a mental state there is a token of a physical /brain state. So, there is no choice between the mental and the physical, because the mental is the physical. Better put, Davidson wants to say that there are events (which are particular, datable occurrences—i.e., events are not types, but tokens). For any single event of the relevant type, however, there are two types of causal explanation which do not reduce to one or the other. We can explain what’s going on via descriptions of physical causality or we can explain what’s going on via descriptions of mental causality, depending on our interest. But we do not need to have a mental causal explanation of a physical causal explanation or a physical causal explanation of a mental causal explanation. We do not (and probably cannot) reduce one type of causal explanation to the other. In any case, it seems like the best choice for understanding the mental in a physical world is a type identity theory. Notice how Davidson’s “anomalous monism” appears to satisfy all the requirements for non-reductive physicalism. First, it is minimally physicalist. It accepts supervenience (at least in a weak sense), and it allows for both causal closure and explanatory completeness. And, it is non-reductive in that it allows for the mental have its own (explanatory) realm. Davidson’s “anomalous monism” is more or less a “black box” functionalism, in that it seems to suggest that we do not need to know how the brain actually works to understand the mental. The aim of Campbell’s book is to defend Davidson’s position of anomalous monism against its critics. Chapter Two outlines three objections to anomolous monism. The first objection (from Honderich, Hess, and Stoutland) claims that anomalous monism results in the causal inefficacy of mental properties, i.e., epiphenomenalism, that the mental is causally irrelevant to physical events. Campbell deals with this objection in Chapter Three. The second objection (from Stoutland and Honderich) is that if there are no psychophysical laws, then it is no more than a coincidence or an accidental connection that physical events have the mental properties that they do. The third objection comes from Jaegwon Kim, which is that anomalous monism’s adherence to supervenience runs afoul of Kim’s “exclusion principle.” The exclusion principle states that “no single event can have more than one sufficient cause occurring at any given time—unless this is a genuine case of causal determination.”  Anomalous monism, says Kim, which holds that the mental is not reducible to the physical, ends up implying that any attempt to explain how one mental state causes another will have two possible and irreducibly distinct sufficient causes. Again, this shows, according to Kim, that Davidson’s position results in epiphenomenalism. Campbell deals with the second and third objections in Chapter Four. But where does this all leave us? The mystery remains as to why consciousness admits of both physical causal “third person” explanation and “first person” mental explanation. That “why” question might not, itself, be a problem to be solved but a paradox to be lived with. ¡No No Sabathia! ¡Sí Sí Lee! 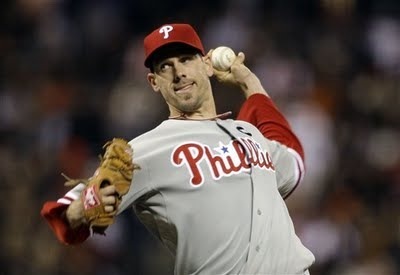 A beauty pitched by Cliff Lee last night (and truth be told Sabathia was pretty good, too). What a great baseball game! Sports-talk radio yesterday afternoon said the x-factor might be Utley stepping up…seems right to me now! Let’s go: three more Phillies wins! Žižek sounds off on a variety of questions: Is democracy a good-in-itself? Is freedom of choice a good-in-itself? How important is “legitimacy” of authority? Is Rawlsian liberalism naive and utopian? What’s the value of Obama’s health care reform plans? Žižek talks to John Derbyshire in the New Statesman. I don’t despise democracy, but for me, although democracy, in the formal sense, is precious, it is not in itself a measure of ­ult­imate truth or authenticity. We shouldn’t fetishise democracy – after all, you can have democratic elections where the majority votes for a rightist populist, and when it does, you have the right to treat the government as illegitimate. I don’t think that this formal electoral procedure should be taken as equalling legitimacy. A large majority of the left doesn’t question liberal democracy and capitalism as such. In the same way that when we were young we wanted socialism with a human face, what a large part of today’s left want is capitalism with a human face. In capitalist relations today, envy is crucial. Never underestimate the power of envy. The End of the Book World??? The book that contains all books? If we are to believe that philosophy is some guy’s opinion, then we have forgotten the essence of philosophy. Philosophy is the touchstone of all progress. We must remember that philosophy is the purest form of dissent. If we do not ask questions, if we do not question authority, if we do not pressure ourselves, then society will never advance. All progress comes from change, and philosophers used to be the backbone of change. Whether we go back thousands of years to Socrates’ “corrupting the youth” or more recently to Bertrand Russell’s condemnation of the Vietnam War, it is obvious that philosophers used to take a stand against a callous system. Now they simply summarize and overanalyze all the irrelevant aspects of life. This “magnificent” philosophy program I have experienced is a glorified course in writing book reports. Philosophy has been badgered to death by dogmatic opinions and shallow thoughts. More. I hope my students and my colleagues are listening…. Alex Callinicos’ speech to student demonstrators at University of Vienna, October 25, 2009.